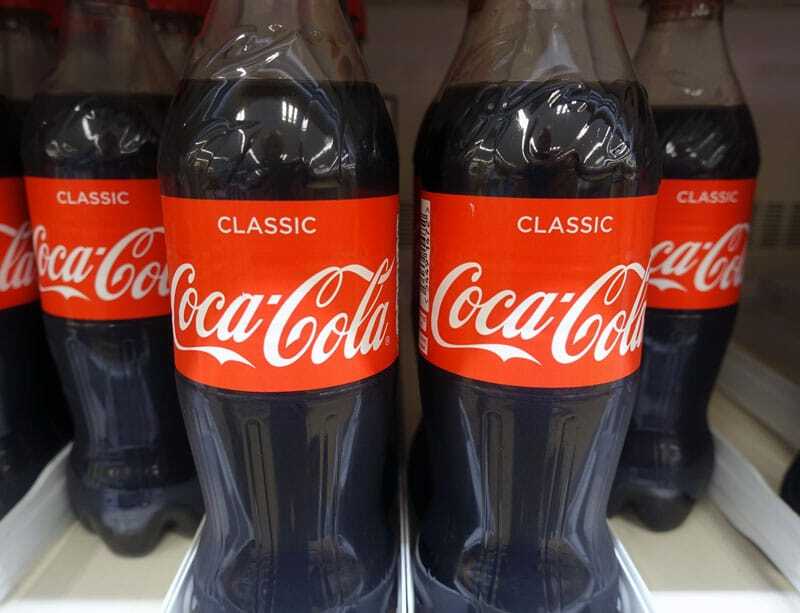 Home > Economics help blog > economics > Multinational Corporations: Good or Bad? Multinational Corporations: Good or Bad? 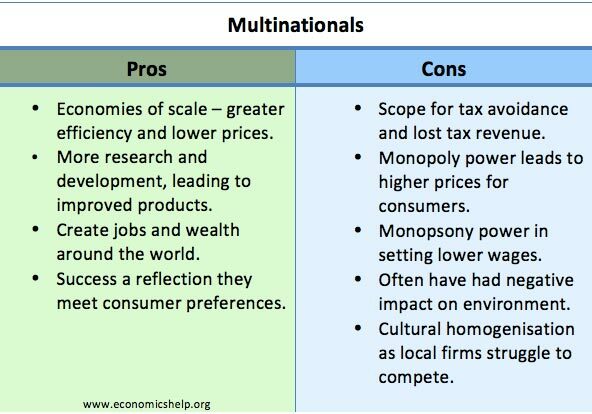 Readers Question: List and briefly describe the positive and negative attributes of multinational corporations (MNCs). Create wealth and jobs around the world. Inward investment by multinationals creates much needed foreign currency for developing economies. They also create jobs and help raise expectations of what is possible. Their size and scale of operation enables them to benefit from economies of scale enabling lower average costs and prices for consumers. This is particularly important in industries with very high fixed costs, such as car manufacture and airlines. Large profits can be used for research & development. For example, oil exploration is costly and risky; this could only be undertaken by a large firm with significant profit and resources. It is similar for drug manufacturers who need to take risks in developing new drugs. Ensure minimum standards. The success of multinationals is often because consumers like to buy goods and services where they can rely on minimum standards. i.e. if you visit any country you know that the Starbucks coffee shop will give something you are fairly familiar with. It may not be the best coffee in the district, but it won’t be the worst. People like the security of knowing what to expect. Products which attain global dominance have a universal appeal. McDonalds, Coca-Cola, Apple have attained their market share due to meeting consumer preferences. Foreign investments. Multinationals engage in Foreign direct investment. This helps create capital flows to poorer/developing economies. It also creates jobs. Although wages may be low by the standards of the developed world – they are better jobs than alternatives and gradually help to raise wages in the developing world. Outsourcing of production by multinationals – enables lower prices; this increases disposable incomes of households in the developed world and enables them to buy more goods and services – creating new sources of employment to offset the lost jobs from outsourcing manufacturing jobs. Companies are often interested in profit at the expense of the consumer. Multinational companies often have monopoly power which enables them to make excess profit. For example, Shell made profits of £14bn last year. Tax avoidance. Many multinationals set up companies in countries with the lowest tax rate. They funnel profit through the countries with lowest corporation tax rates – e.g. Bermuda, Ireland, Luxemburg. For example: in 2011, Google had £2.5bn of UK sales, but only paid £3.4 million UK tax. A tax rate of 00.1% despite having a global-wide profit margin of 33%. (tax avoiding companies) This means the multinationals are ‘free-riding on smaller companies who cannot attain the same creative tax accounts. Their market dominance makes it difficult for local small firms to thrive. For example, it is argued that big supermarkets are squeezing the margins of local corner shops leading to less diversity. In developing economies, big multinationals can use their economies of scale to push local firms out of business. In the pursuit of profit, multinational companies often contribute to pollution and use of non-renewable resources which is putting the environment under threat. ‘Sweat-shop labour’ MNCs have been criticised for using ‘slave labour’ – workers who are paid a pittance by Western standards. Outsourcing to cheaper labour-cost economies has caused loss of jobs in the developed world. This is an issue in the US where many multinationals have outsource production around the world. Some criticisms of MNCs may be due to other issues. For example, the fact MNCs pollute is perhaps a failure of government regulation. Also, small firms can pollute just as much. MNCs may pay low wages by western standards but, this is arguably better than the alternatives of not having a job at all. Also, some multinationals have responded to concerns over standards of working conditions and have sought to improve them. What do you think of Multinational companies? – leave comment below. From my point of view, MNCs are evil as globalization. They have no pity at all to the developing nations. Employees are over-utilized beyond the normal working hours with minimal payments, for example, TPC Limited. They destroy our natural environments like Geita Gold Mine. They are meant to benefit their home countries not the host countries. MN Cs are just important on the perspective of Why they are created. MNCs are essential for socioeconomic integration and globalisation, without them, we would not be as connected with other countries as how we are today. However, MNCs are incentivised by abnormal profits which makes them take unethical decisions like exploiting their employees. It’s a really grey area to be honest because apart from the socioeconomic advantages and disadvantages you also have to take into account political impacts for each country. every company is seeking to make profit.